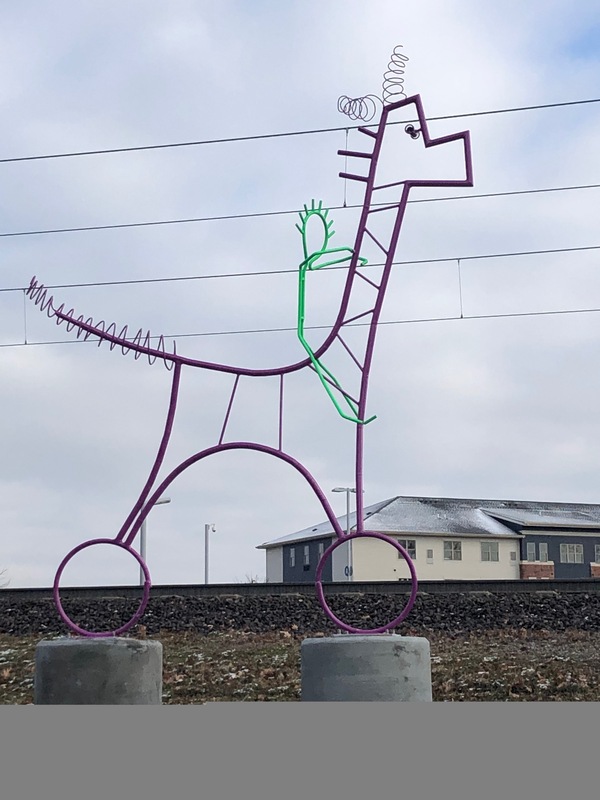 The St. Clair County Transit District (SCCTD) teamed up with Art on the Square, UMB Bank and local architect-artist Gary Karasek to bring art to life along eleven miles of the MetroLink and MetroBikeLink trail in St. Clair County. Sponsored by UMB Bank, Rails, Trails and Art is a series of vibrant, moving Shtick People Sculptures that have been installed along the trail for the enjoyment of walkers, bikers and transit users in Southwestern, IL. The installation occurred in December, 2018. A dedication ceremony is set for the Spring, 2019. The sculpture series initially debuted at the 2018 Art on the Square festival in downtown Belleville in May. The St. Clair County Transit District installed the art along the MetroLink alignment and trail from Belleville Memorial Station through Swansea, downtown Belleville, Southwestern Illinois College and terminating at the Shiloh-Scott Station. The Shtick figures include: Bicyclist; Space Flyer; Unicyclist; Bird Power; Monster Bike; Mythical Beast; Trike; Pogo Shticks; Windy and Skateboarder.